As a former Secret Service agent who was tasked with protecting President Obama and President George W. Bush, Dan Bongino saw things most people never see in Washington. So Bongino quit his lucrative job to run as the Republican candidate for the U.S. Senate against Maryland Democrat Ben Cardin, who is ranked as the third most liberal Senate Democrat. He’s been endorsed by Sen. Mike Lee, R-Utah; Rep. Allen West, R-Fla., former Alaska Gov. Sarah Palin and other leading conservatives. Bongino said there are catastrophic consequences of Obama’s choice to surround himself with “academic” advisers and “yes” men. Bongino pulls no punches when talks taxes. He noted that if the U.S. were to cut every dime of discretionary and military spending, it would still run a deficit this year. “That should show you how bad of a situation we are in and how the time for real leaders is now – or you’ll rue the day you didn’t elect them,” he said. Asked what the nation can do to address this alarming problem, Bongino said there are only two approaches: 1) serious spending cuts and 2) accelerated economic growth. He also said America has no choice but to grow out of its economic slump. “Socialism is basically controlling the means of production – government bureaucracy owning it,” he said. “Traditional socialism was a joke. No serious person believes it works. It’s been tried, and it not only failed but led to the deaths of hundreds of millions of people in the process, some rather violently. Bongino has a warning for those Americans who argue for so-called “fair taxation” and plan to vote for Obama this November. If anyone truly questioned Obama about his taxation plans and asked him what percentage each income group should pay in taxes, Bongino said, they would never get a straight answer. “Not to try to be smart about it, but what is the president’s foreign policy?” he asked. “I’d love to know. “The policy with Iran is what? Just leave it alone while we have an opportunity to affect change on a hegemonic regime? “Egypt, what was the foreign policy there? Hosni Mubarak, I’m not inviting him over for dinner, but under America-first foreign policy, at least he was an ally and kept the peace with Israel. He did nothing new. We allowed him to be deposed, did nothing, and now look what we’ve got over there. We’ve got our embassy being overrun. “Libya? Now we choose to get involved, but only in a limited role in which the president takes credit. Our foreign policy in Libya seems to have collapsed there. Bongino said Obama’s foreign policy has him completely stumped. “My only guess – and this is my version because he doesn’t really have a foreign policy – is it’s to extend our hand, have it slapped away and then find a reason to apologize for them slapping your hand away. He said Obama is failing to explain to the American people that there are only two ways to allocate resources. Bongino explained the differences between the two approaches. “There’s a board of 15 bureaucrats that are going to be appointed – keep in mind, not elected, appointed by more government bureaucrats – and are going to set prices and say they’re using a price model, but they’re not. “Let’s say a hip replacement is $7,000. What they’re going to do when they run out of money – because they can’t control prices in the rationing system – they’re going to set the price for reimbursement to $6,000. What doctor is going to take that? None of them! So you just de facto rationed those products. Bongino is a devout Catholic, and he said his faith in God has always guided his decision-making. “I remember even as a kid praying and asking the Lord for guidance,” he said. “He has a way of tapping you on the shoulder and telling you what direction to go, but it’s up to you to go in that direction. However, Bongino disapproves of the Obama administration’s treatment of certain religious groups. “If you’re of a Christian or Jewish faith, you get to be a back-bencher, but if you’re in one of the selected groups that he seems to choose, all of the sudden you move to the front of the line,” he said. Many leftists frame the illegal immigration debate as a situation of Republicans against all immigrants, Bongino said, but nothing could be further from the truth. Bongino said he supports construction of the U.S.-Mexico border fence and use of E-Verify to perform background checks on workers. However, Bongino said a good, targeted immigration policy would attract the “world’s best and brightest” to the U.S.
“We would be, by far, the most prosperous country on earth for the next couple of centuries,” he said. To do that, Bongino recommends a points-based immigration system. Bongino said he’s a supporter of Second Amendment rights. However, he said there’s a difference between the right to bear arms and the right to legally bear arms. Cardin was elected to the U.S. Senate in 2007. Prior to that, he represented Maryland in the U.S. House of Representatives for 20 years. No Republican senator has held a seat in Maryland since moderate Sen. Charles “Mac” Mathias Jr. retired in 1987. Nonetheless, Bongino is convinced he can pull an upset victory. “We’re in a three way race. All we need is a plurality, not a majority,” he said. “We’ve got three debates coming up. I think they’re going to be fantastic for us to get our ideas out there. Bongino is optimistic about his chances this November. He said Cardin’s cash advantage is dissipating. Though political pundits often dismiss conservative candidates running in deep blue states, I don’t believe in ignoring good candidates simply because they’re fighting uphill battles against the odds. In fact, I find such candidates incredibly brave and especially worthy of encouragement. In many cases, they are often the most articulate and courageous new conservative voices out there. This is more than just a race of Republican vs. Democrat or conservative vs. liberal. It’s about taking our country back from the career politicians in both parties who have spent us into debt, nearly taxed us to death, enriched themselves, rewarded their cronies at our expense, and have no vision to help the private sector create the jobs we need to get this economy moving again. They are the reason why Congress’ approval rating is at an all-time low. In supporting Dan Bongino, we are offering Maryland voters a clear choice either to continue with the failed policies and crony capitalism of the permanent political class, or to shake things up with Dan Bongino and cast a vote that helps put our country back on the path to prosperity. 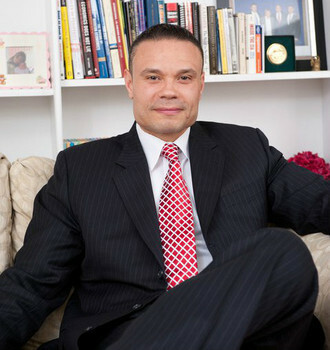 Bongino replied: “If you think I left my job and put my financial security and my family’s financial security on the line to become what I hate most – to become like one of them, what I ran away from – then you’ve got another thing coming. “I’m not running to spend a career behind those walls of Congress. I’m not interested. Remember, I lived this life for 12 years inside the White House and around the White House. I was ultimately sickened by the insulated bureaucracy. “I’m not interested in their Christmas parties. I’m not interested in their Air Force One rides. I’m not interested in their chauffeured limos and their fancy dinners. 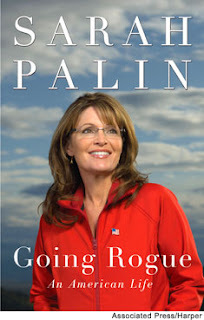 Like most of Governor Palin’s supporters, and many of her detractors, I read Going Rogue the moment it hit the shelves in late 2009 to get a deeper sense of who she is, what she’s accomplished, and where she might be headed. I have also listened to the CD several times and continue to do so, over and over. In spite of having digested its contents a plethora of times, my favorite part remains unchanged. Every time I hear the Governor’s voice reading that portion, I have to rewind it and listen again–and again. It resonates in my spirit, encouraging me greatly. I know, from my own personal experience, exactly what she means, so I grab ahold of every word and the spirit behind it. In addition, this portion, without question, is the single most powerful tool to understanding how she arrived where she is today and how she will fulfill her destiny in life–whatever that destiny is. There was a longing inside me that winter, a sense of purpose hovering just beyond my vision. Was it ambition? I didn’t think so. Ambition drives; purpose beckons. Purpose calls. I definitely wasn’t driven toward any particular goal, like power or fame or wealth. So what was it? I wondered, as Piper’s sweet breath against my neck matched the rocker’s rhythmic glide. I prayed again that if I was to resign myself to what felt like a public service career cut short, that I’d embrace being home full-time. I asked that the fire in my belly, and whatever was feeding it, would simmer down. It irked me that too often women are made to feel guilty for seeking the next open door, no matter what career choices we make. That seems universal. But one doesn’t just create passion, nor consciously generate the feeling that there’s a door standing open somewhere, even if you can’t see it yet. And it wasn’t anyone who pressured me: “Sarah, you’ve got to get out there and fly! Go do more!” But I knew there was something more. I thought of the graduation speeches I had been honored to give over the years as mayor and began to apply their message to myself. I often told the kids to ask themselves: “What gets you excited to wake up in the morning? Is it science? Art? Children, animals, books, sports, mechanics? What is the desire of your heart? I wasn’t sure what I was to do next, yet. But I also knew I was blessed with a supportive family and a husband who took joy in my working hard, so I knew I had options. As I rocked my daughter all those dark nights, I knew that what still stirred passion in me was the desire to make a positive difference for others, not just in my family and community but in the wider world as well. I resolved to seek confirming signs along the way–the open doors–to show me the right road. 1. She is well aware that she has been called to great purpose. What distinguishes Governor Palin from many others is that she truly is a public servant. She’s not driven by aspirations of grandeur. Her ascendancy is the result of pursuing her purpose, not fixating on fame and fortune. 2. The fire in her belly is nothing new. Greta asked her about it, but this certainly wasn’t the first time she acknowledged it. Indeed, she’s possessed that fire for a long time. Nonetheless, she submitted that fire to God, to the point of even asking God to remove it, if need be, proving again that she’s more interested in where she’s supposed to be and what she’s supposed to be doing than she is in forging her own way and doing her own thing. She doesn’t deny the fire; she’s just willing to lay it down. However, as she now knows, no doubt, it was God who put it in her, and He knows exactly how to use it. 3. Outside pressure is not the motivating factor in her life. The beckoning Governor Palin felt, and ultimately acted upon, wasn’t because of any pressure others put on her. No one had to push her forward or tell her there was more. She knew it already. I submit that she knew it more than those around her did, just as she knows it more today than her supporters do. After all, it’s her belly; she can feel the fire! She embraced her destiny because she could sense it. She was not oblivious to it. Perhaps it took her some time that winter, sitting in her rocker, holding baby Piper and praying, to know what was next, but she knew there was a next, and she was willing to seek the way to get there. I’m convinced that she would never ignore the answers she receives as she seeks them, no matter the pressure. 4. She never conjures up passion. Passion isn’t manufactured, she realizes. How true. Countless times people try to feign excitement about some issue or movement. That might work for a while, but eventually faking gets wearisome. Many times I’ve heard: “Some things are taught, and some things are caught.” Passion is one of those things that cannot be taught; it’s caught–or it isn’t. If you don’t have it, you’ll soon know–and so will others. Governor Palin exudes passion, which is the only way she could possibly have remained such a vital part of the political landscape after all the smears, lies, and innuendoes she’s endured with such stamina and grace. 5. Family is a vital part of her decision-making process. The Governor finds peace in knowing that she has a family who knows she’s been called to make a difference–first, to her own family; then, to her community; and finally, to the world. Their support gives her the freedom to exercise options in life. Every success she’s enjoyed is the result of her family cheering her on. They will always be a part of what she chooses–or doesn’t choose–to pursue. 6. What draws her directs her. There was a time I thought I knew Governor Palin’s next step. I cannot say that with certainty now. Though I do not know details, I do know destiny when I see it–and I continue to see that all over her. As Going Rogue has become a constant in my life, allowing me a look into what has made Governor Palin who she is, my favorite passage continues to give me confidence that she has the right idea when it comes to knowing how to move forward even now. I am convinced that she has the right approach to meeting life’s challenges and decisions. Because of this, I am also convinced she won’t miss the open doors that are set before her, including ones that lead her down the path of further impacting our country. However that ends up playing out, I trust that America will be the better for it. 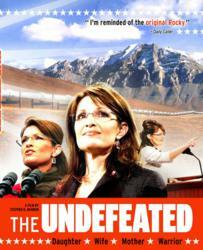 It’s been anticipated for months and now, “The Undefeated” is available today on DVD. Personally, I am headed out to my local Wal-Mart before work to pick up five (yes, that’s 5) copies. Three copies will be used as gifts, one copy is for myself, and one I will use to loan to others so that they can see for themselves the stellar record and accomplishments of Governor Sarah Palin and her team. If you can’t find the DVD locally, you can order it online at Walmart for $12.96 or Amazon for $12.99. Walmart also has what is being promoted as an “exclusive”, “The Undefeated” DVD packaged with the “Going Rogue” audiobook for $14.96; however, at time of writing the item is shown as out of stock. Sarah Palin’s second book: America by Heart : Reflections on Family, Faith, and Flag has popped up on the Washington Post’s best seller list months after it was first released, and made it as high as number two on the New York Times best seller list. A new book this week, though not new to the this particular bestseller list, is Sarah Palin’s 2010 “America By Heart” — the fact that it’s selling well again (at least this past week) seems to defy the notion, popping up in scores of articles lately, that her influence is waning and she’s less of a force than she once was. After the game changing speech Sarah made on Saturday in Wisconsin, I bet sales of the book will continue to be brisk! On Saturday Sarah threw down the gauntlet and proclaimed to both Barack Obama and the Republican establishment: “Game on! Sarah ‘s first book, Going Rogue, which came out in late October of 2009, was the number one selling non-fiction book of 2009 and spent many weeks at number one on the New York Times best sellers list. America By Heart is a follow up to Going Rogue and like the first, is a serious policy book, and an engaging read. Though not as heavily promoted as the first, it sold over a million copies [and counting!] This book is a must read for anyone who wishes to understand how Sarah Palin governed Alaska and how she would govern as President. In addition to the books Sarah has written herself, great read is The Faith and Values of Sarah Palin, which we reviewed here. The authors, Stephen Mansfield and David A Holland, spent a lot of time with the Palin and Heath families, as well as friends of the family. This book gives you a serious history, not only of Sarah, but her family, Todd’s family, and Alaska itself. It’s a must read book for those who want to understand Sarah Palin and what makes her tick. You can read my review and listen to Stephen Mansfield read some of the book here. 1. Real time notices of Sarah Palin Facebook or Twitter postings. Sarah Palin followers just have to be the first to know about a new post. 2. Upcoming Sarah Palin media appearances. Whether it be Fox News or a simple radio appearance, real-time updates of coming appearances would be most helpful. 3. A register of new online polls regarding Sarah Palin. We like to vote for positive things regarding Sarah and need to know where to go to support her in any online poll. 4. Red Alerts for countering media bias regarding Sarah Palin and her family. We like to voice our opinions regarding Sarah to help counter any negative “hit piece” that is published about Sarah or her family. Links to comment pages would be a welcome thing. 5. Video archives of Sarah Palin appearances. We would like a depository of Sarah Palin videos that we could link to on our smart-phones to help counter real-time Sarah critics that we come across in our daily lives. 6. Sarah Palin’s favorite wild-game recipes. After all, you can only make Moose stew once in a while. 7. Sarah Palin quotes. She has coined or re-invented such fabulous terms as “death panels”, “going rogue”, “mama grizzlies”, “blood libel”, “a servant’s heart”, “lamestream media”, “refudiate” and others. We want to use these terms and would like instant access to new and existing ones, for whatever purpose. It would also be helpful to have links to the source where where she first used them. 8. Shoes. Okay, I throw this one out for all those wonderful ladies that notice another woman’s shoes. I suspect they might like to know what latest fashion Sarah is wearing on her feet, whether they be pumps or sloggers. 9. 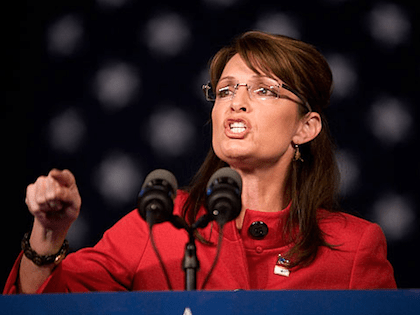 Sarah Palin media smack-downs. Okay, I know this could be included in #4 above, but it deserves its own app because we like Sarah’s feistiness and want to be the first to applaud it. 10. Smiles. Sarah Palin has one of the most magnificent smiles that has ever existed in a politician. We want to see every single one that comes across whatever media source runs it for a collective glimpse into her heart. I could probably go on, but you get the idea. App-makers? Take a look at the New York Times Best Sellers List, and you will find Going Rogue yet again. It remains #1 among hardcover nonfiction books for the 6th consecutive week. Going Rogue had a great 2009, accomplishing more in its short life than much older pieces of nonfiction. It ended the year at #1 on Publisher’s Weekly Best-Sellers List for hardcover nonfiction and #1 on the Wall Street Journal Best-Sellers List for nonfiction. Congratulations, Governor Palin, on the success of your memoir–and it’s still going strong. There’s an old expression that goes like this: “God don’t like ugly.” I could not count the times I heard that growing up. It was used as a rebuke by the adults in my life whenever I did something they deemed inappropriate. As I got older, and made wiser choices, the need to be reminded of this “truth” diminished. However, not everyone grows up and makes wiser choices. Medred’s fascination with discrediting the Palin family is…well, ugly. What’s it this time? Well, this time he fancies himself a Going Rogue fact-checker, and in that he’s in bad company already. However, Medred clearly isn’t capable of checking anything because he can’t get his facts straight. For this, he gets called out. Mel Bryant, my colleague over at Conservatives4Palin, points this out in an article called “Truth in Reporting.” Bryant exposes, not only Medred’s ridiculous preoccupation with “checking on” Governor Palin, but also his gross inability to do so with any success. After his adventures in Tombstone, the legendary lawman Wyatt Earp came north and spent a few years in Nome during the gold rush. On the other side of the law was “Soapy” Smith, a Wild West crime boss whose tight-knit gang moved from Colorado to Skagway. They made a mint cheating gold miners out of their cash. It finally caught up with Soapy Smith: he was killed in a shoot-out with a vigilante gang. As part of a larger piece at Alaska Dispatch, Medred fact checked this paragraph. In this check, Medred said that the historical record states that “Soapy” was not killed in a shoot-out with a gang, but was instead killed in a scuffle that turned into a gunfight with a man named Frank Reid. Reid, he said, shot “Soapy”. Among others, he cited a passage from Jeff Smith’s book to bolster this version of events. According to Smith, however, Medred was off base. My name is Jeff Smith, author of Alias Soapy Smith: The life and Death of a Scoundrel and the website Alias Soapy Smith. It is important to me that people know that you took the facts from my book and my website completely out of context and horribly and incorrectly stated my conclusions about the Shootout on Juneau Wharf in which my great-grandfather, Jefferson Randolph “Soapy” Smith was killed. I can only surmise that you either did not read the book and/or website or that you intentionally left out major important portions of one or both in order to show that Sarah Palin was incorrect in her statements on page 13 regarding Soapy Smith’s fight with vigilantes. Had you read the book and/or my website you would have clearly noted in my book (pages 532-580) and on my website (HERE) that Frank Reid was NOT the man who killed my great grandfather, and that in fact, another member of the vigilante guards present joined in the fight and wrestled Soapy’s rifle away from him and turned it on an unarmed Soapy and shot him in the chest killing him instantly. Whether you agreed or disagreed with Soapy’s ways is irrelevant to the fact that Soapy was shot while wounded and unarmed, which in most civilized communities is murder. The vigilantes hid this fact from the courts in order to save their own new found power. Mr. Medred’s “clarification” is filled with errors but truth in history is not his goal. Disproving Sarah Palin’s book is his goal. Read the full C4P article here. As you know, on November 21st, I was at the Rochester Going Rogue book signing. Photographer Shealah Craighead has now put the pictures of the event online, and they’re available for purchase. She took over 1200 pictures in New York, and I am particularly excited because I had the honor of volunteering at the event, which affords me a multitude of pictures from which to choose. I will definitely be purchasing a few. Great job, Shealah! Early in the photo album are two pictures of the Governor and I conversing, taken in the back upon her arrival, but there are so many others where I am in the background having the time of my life. Seeing these photographs was like reliving that amazing experience where I got to hear so many people interacting with her. I wrote about that experience in detail and included pictures and a video here and followed up with more pictures here. Go straight to the Rochester, NY photo album by clicking here to see what it was like for me to work alongside Governor Palin that day, and see all the people who came out to show their support for America’s common sense conservative. Go here for a choice of other book tour stops of which you’d like to see pictures. If you took part in the tour, treat yourself by purchasing one or more pictures, and if you know others who participated, why not surprise them with pictures they will surely cherish for many years to come? In this interview, John G. Miller spoke with Ron Devito about winning Governor Palin’s red Going Rogue jacket in an online auction to benefit the Wounded Warrior Project and Fisher House. Between QBQ and Flipping the Switch, Miller has over one million books in print. Outstanding is set to publish January 1, 2010. The winning bid was first announced by Podomani, a web design and marketing firm which handles Miller’s websites: QBQ and Outstanding Organizations.